George Henry Boughton was born in England and his parents took him to America when he was a baby. When he grew up, he became a painter and sold his first painting when he was 19 years old. He took the money and visited London. Then he went back to America for a couple of years. He decided to study in Paris for a while, but eventually made London his home. He established an art studio there in 1861 and began to concentrate his work on early American Colonial history. His paintings of two pilgrims going to Canterbury inspired Van Gogh's first sermon. Van Gogh admired his work very much. He liked to paint landscapes and also pictures of people. 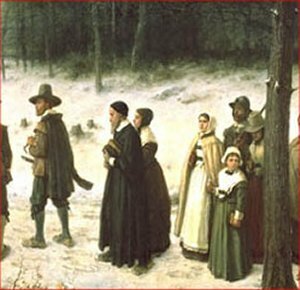 In this painting that we are studying, he shows a group of Pilgrims walking to church. It is winter time and there is snow on the ground. Why do you think the men are carrying guns? 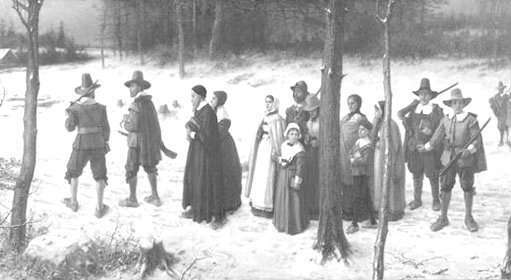 Life was very hard for these early settlers, and many of them died because of the extreme conditions. Boughton also was an illustrator of books. 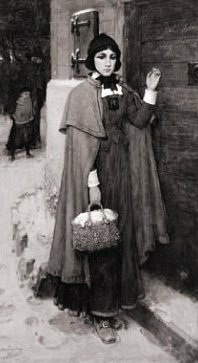 He drew the pictures for Nathaniel Hawthorne's The Scarlet Letter and Washington Irving's books Rip Van Winkle and The History of New York. He wrote a book called Sketching Rambles in Holland in 1885. You can see the illustrations at Google books. 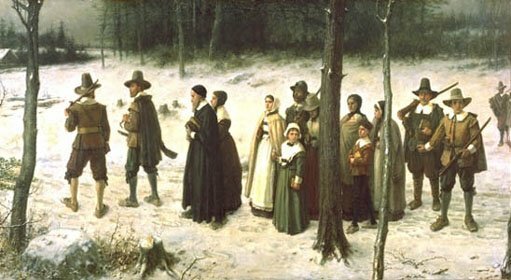 Press "Go" to search for books about Pilgrims in early America. This page displayed 72,149 times.